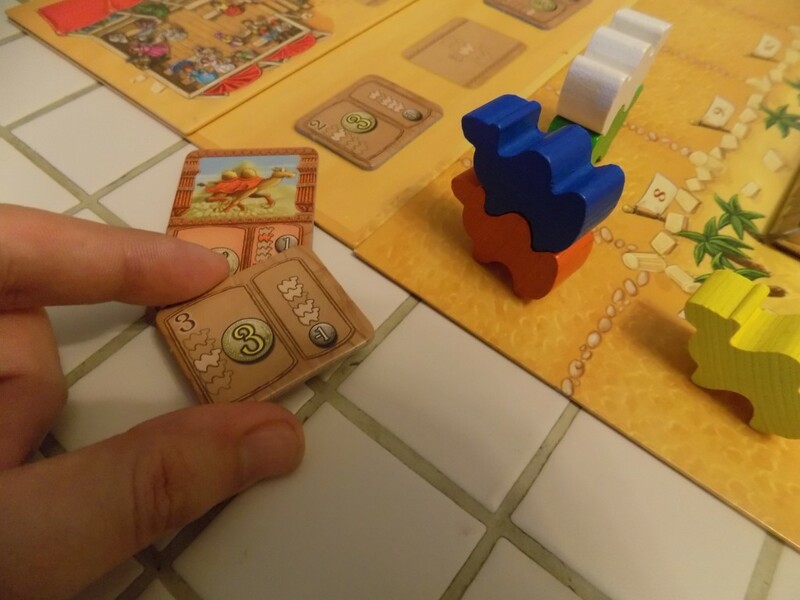 Back in January of 2015 we reviewed Camel Up from Z-Man Games, a game of fast paced betting in the world of camel racing (which is a thing.) We reviewed it favorably and urged you, dear readers, to try it out. 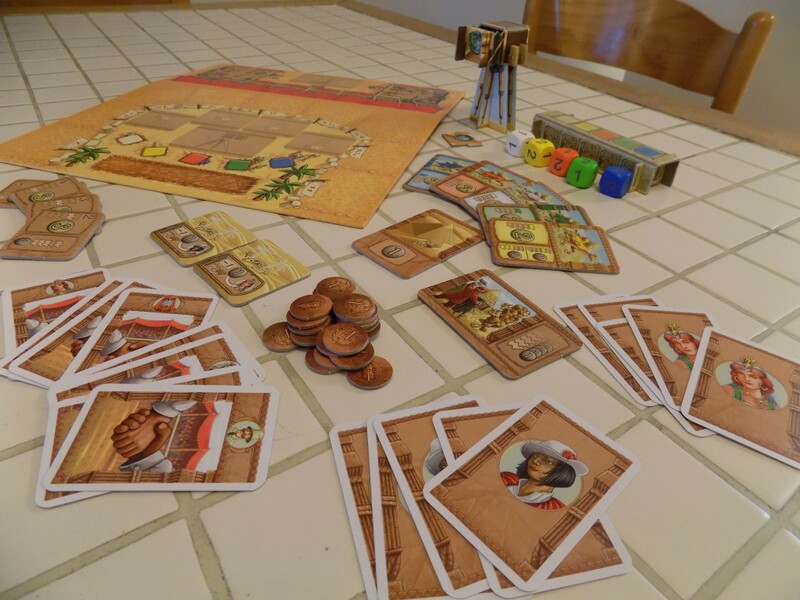 Well, how excited were we when Camel Up: Supercup, an expansion to this great game, was released? Well, pretty excited, to be honest. But is it worth the price? Does it add much to an already satisfactory base game? Well, we just had to get our hands on it to find out. 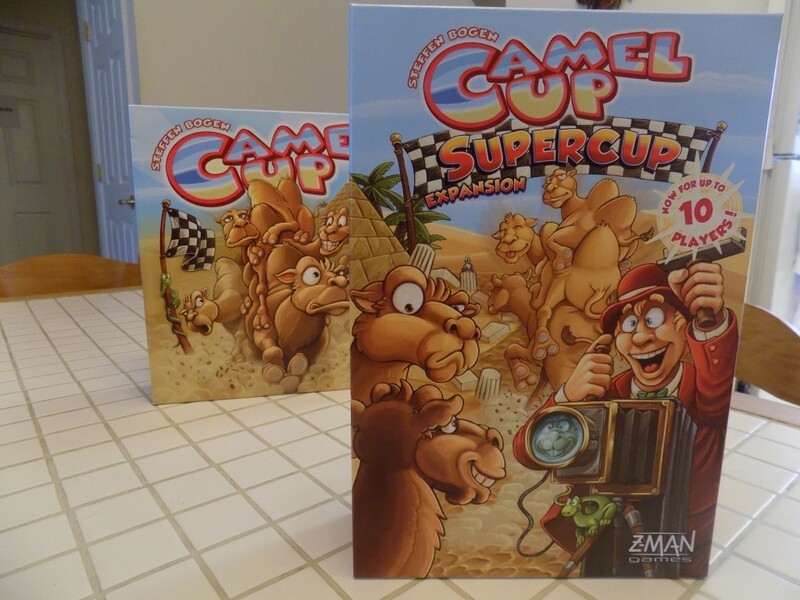 So, to get to the point, what does Camel Up: Supercup add into the mix of sand, money, and haphazardly stacked camels? Inside this large box (for an expansion) there are four different modules, which can be added to the base game individually, together, or in any combination. In addition, it adds two more players, bringing the total to ten- something which can make this game invaluable when more people than expected arrive at a game night. (However, it should be noted that if the game is played with nine or ten players, all four modules must be used in addition to the base game.) So let’s take a look at each of these modules individually, shall we? The first module adds five more Leg Betting Tiles (all of a two pound value), an extension to the race track, and five more dice. However, not all five of these dice will be added to the pyramid each leg- only one of them will. At the start of each leg, an extra die will be added for the camel that is in last place- meaning that dark horse bets may have more merit than in previous races. 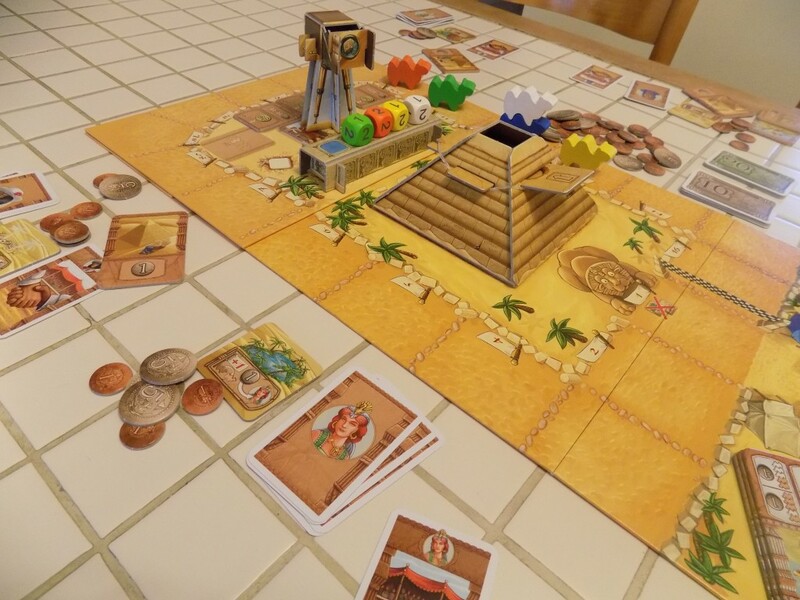 However, all of these dice only have ones and twos (unlike the base dice which go up to three) so there’s no worries about camels unfairly shooting up the track too far. 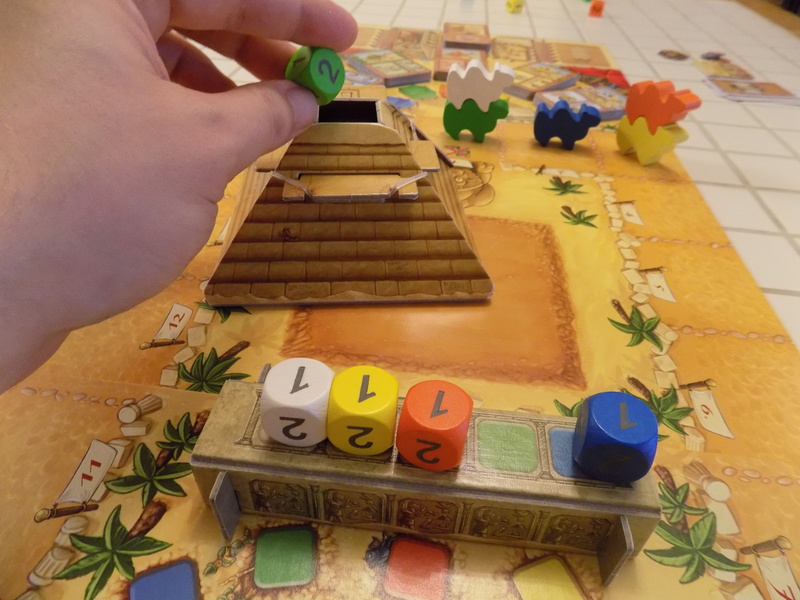 In addition, there is a variant of this module which gives a player a possible second action: by returning one of the pyramid tiles to it’s stack (the tiles you receive for moving a camel) you can choose one of these extra dice and add it to the pyramid, so long as it isn’t the color of the camel in the lead. This variant can majorly change the dynamic of a race as legs can last much, much longer than before. The second module adds this neat little old-timey tripod camera and an associated tile. On a player’s turn, they may take the camera and its tile, and place the camera next to (and facing) an empty space on the racetrack. If a stack of camels ends its move on the space that the camera is watching, the camera operator gets one pound for every camel in the stack! Then, the camera and its tile are returned to their space on the board for someone else to enjoy (and possibly make a pile of cash off of.) This adds not only a new way to procure precious pounds but also an interesting new component for players to fiddle with. Regret your bet? Change it! The third module deals with position bets. In addition to adding the five new Leg Betting Tiles (which were used in the first module) it also introduces the use of Position Betting Tiles. Normally, the Leg Betting Tiles only pay off if the camel color you’ve selected is in first place at the end of a leg (or substantially less if they are in second.) But just as an example, you can use your action to pick up a Position Betting Tile of your choice, and hey presto, you actually weren’t betting that the green camel would be in first at the end of a leg- you were betting that it would be in fourth! Sure, you’ll only get three pounds for any bet changed this way, but getting three pounds is better than losing one any day. This module can really help you react to unforeseen changes that can shake up the standing of a race. Finally, the fourth module introduces the mechanic of Betting Partnerships. 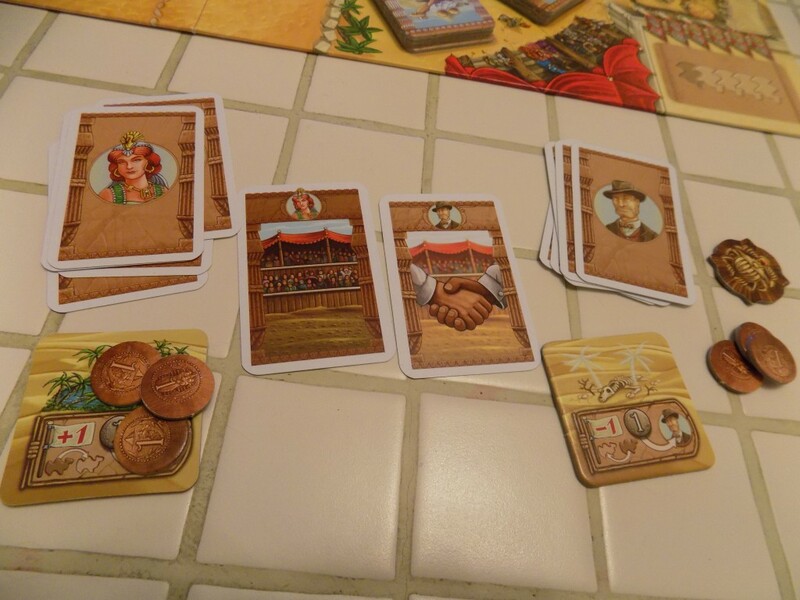 Each player will receive a Betting Partnership card at the start of the game with the “Available” side face up (the side without the picture of the shaking hands.) On a player’s turn, they may take another player’s “Available” Betting Partnership card and exchange it with their own- both players then flip over their card, showing that neither of them are “Available” any longer for the length of that leg. (By the way- no one can refuse to be in a partnership with you. How nice.) When it comes time to receive payouts at the end of the leg, each person in a partnership may choose one tile belonging to their partner and add it to their own results (and the original owner still gets it too.) When setting up for a new leg, cards are exchanged back and all are flipped to their “Available” side. This mechanic means that more money can be paid out to more players- and a savvy player who isn’t doing so well can piggyback on another (perhaps more skilled) player’s winnings. This means that those players who would normally be at the back of the group concerning their total of pounds can hop up a few places in the ranking, keeping the game much more competitive. Each of these modules adds a different fun and exciting mechanic that can really shake up the dynamic of an already great game. Individually, each module adds a little something different, but add them all together and you have a game with many more moving parts. A word to the wise, however: like so many other games, it may be best to start new players off with the base game and gradually add each module one at a time- otherwise, they are likely to become overwhelmed at their options when their turn comes. But on the whole, Camel Up, as we’ve said before, is a great, solid game. 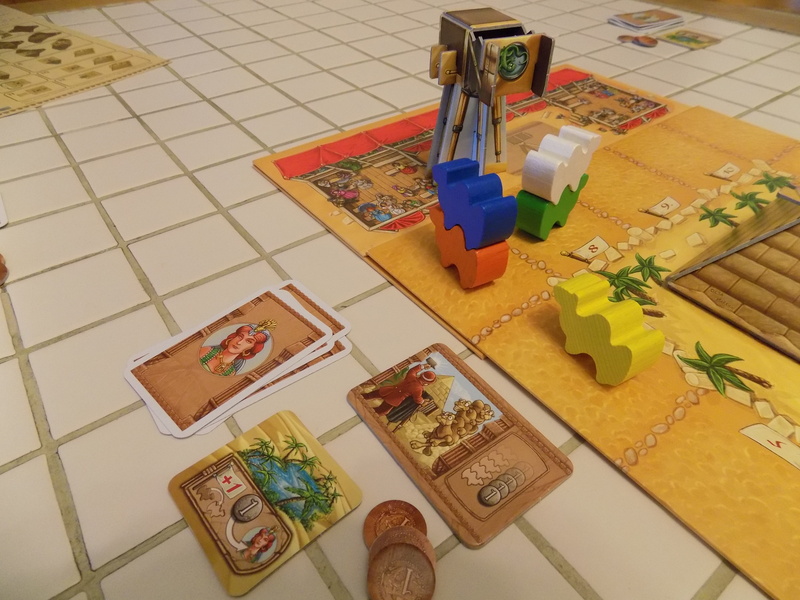 Camel Up: Supercup just mixes things up a bit, keeps the game a bit more tightly competitive and may help players who feel that they’ve experienced all that Camel Up has to offer come back to the table for a few more games. Combine this with the fact that you can now play this game with more players, and you have a sure fire win for your next game night. Definitely check this one out, dear readers, and experience all that this expansion has to offer.